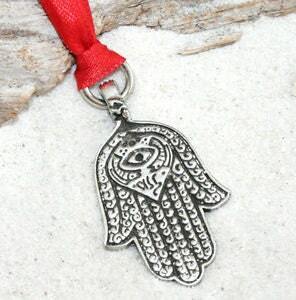 This protective Hamsa Hand Ornament is handcast and hand-finished in solid American Pewter with a shiny finish resembling antiqued sterling silver. This unique Holiday Ornament comes with a Red Satin Ribbon ready to hang from your Christmas Tree or as a Holiday Decoration for your home. They also make terrific gifts...you and your loved ones can enjoy this lovely keepsake for years to come! An ancient Middle Eastern symbol of good luck, the Hamsa Hand is used to draw good fortune, happiness, love, and good health to the wearer. In its role of protection, it is also believed to protect from the evil eye. It brings blessings from God to calm and help wearers focus on the tasks at hand knowing that they are safe from evil. Alternative names for the Hamsa Hand are the Hand of Fatima and Hand of Miriam. Namaste.